Here I am at last. In all the moving around of the "stuff" I lost my cord for getting my photos onto the computer. Of course I found it when looking for something else!! Isn't that always the way? 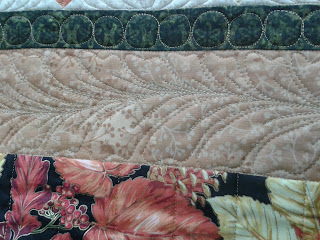 Been working hard trying to catch up on my customers quilts. This beautiful medallion quilt of Maria's is a wedding gift and is going off to Australia. 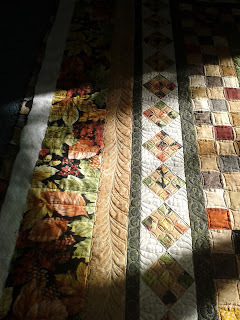 Although it seemed like the never ending quilt for a while, I am so thrilled in the end with how it looks. It was only a bit of a struggle because I am still in recovery mode. The colours are superb. My photos are not. Sorry about that. 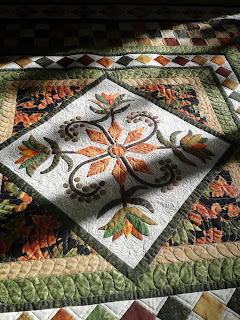 It was very hard to get a photo in a good light and these first couple were taken at Maria's place when I delivered the quilt. They do show up the quilting well though. Some of the border treatments. The thread is Superior Magnifico 2063 - a lovely gold colour that really highlighted the gold edged leaves in the focus fabric. In the cream backgrounds I used So Fine 405 which worked perfectly. I had to do the on point triangles using Plan C. Plan A & B were too difficult with my smaller 18" throat. I was actually really happy with this plan and it probably looked better that the first plan...lol. Because the focus fabric featured beautiful leaves and berries, I used these images in the quilting. The feather border uses the leaf style of feather and I was delighted with how it came up. Only the second time I have tried this one. Using continuous curves on these wee 3" 9 patches made them quilt up a lot faster. 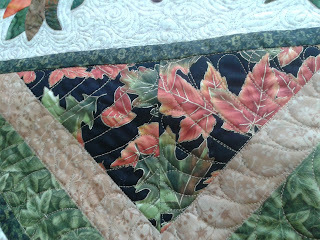 Used the leaf feather in this square and another border of cc. 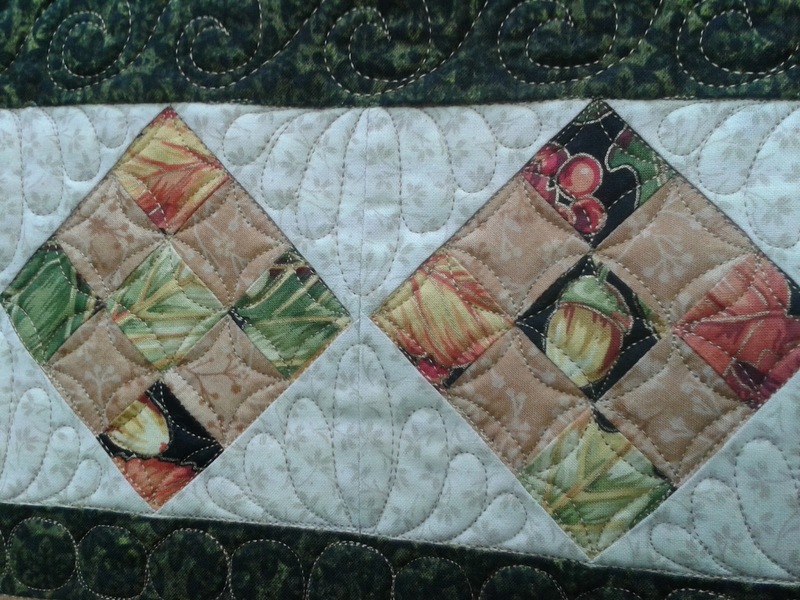 Thanks Maria, it was such a pleasure to quilt your lovely quilt. 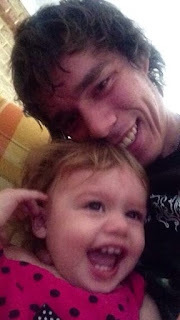 One last pic...this is my most beautiful great granddaughter who lives in Perth, Australia. I am praying hard that I will get to meet her at the end of the year. She will be 3 in October and is called Tiana. Dad Wiremu loves her so much and they spend lots of time together. Take care and I wont make any rash promises about being back....just will do my best to chat with you again soon. The finished quilt is stunning, it certainly will make a great present. Hope your plans of meeting up with your Grandie all turn out perfectly. Most importantly what a happy lovely granddaughter! 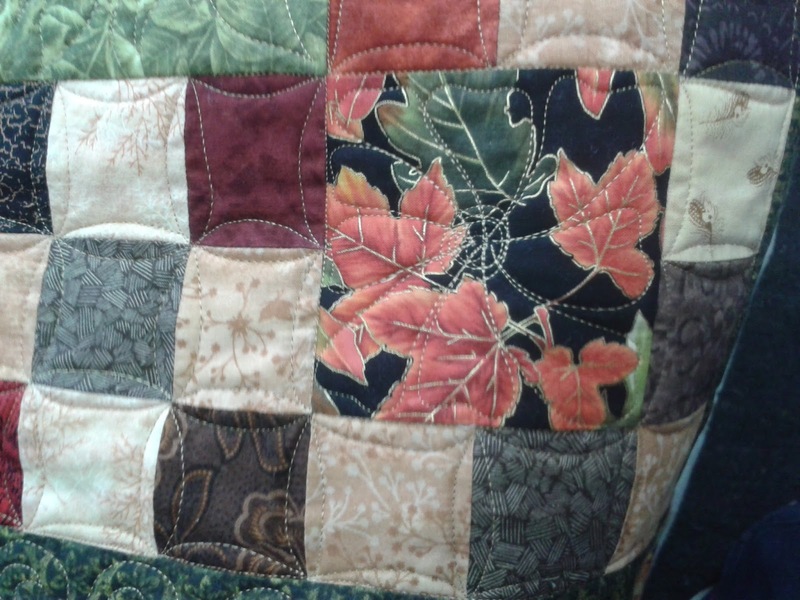 Loving the quilt and the quilting.